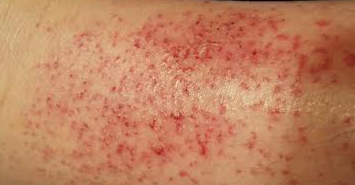 Healing Liver Cirrhosis: Amazing Testimonials from people who are healing from cirrhosis! 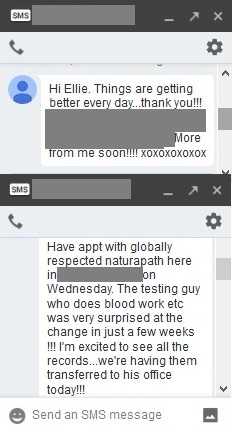 Amazing Testimonials from people who are healing from cirrhosis! At first I had these testimonials on this page, about the water, but it was getting a little long so I decided to create a separate page. I really want to thank the people who allowed me to use their testimonials, so people can see, it's not just my husband who got these incredible results! ☺ It's true that I can't make medical claims, but it seems more than coincidental that these people got similar results. 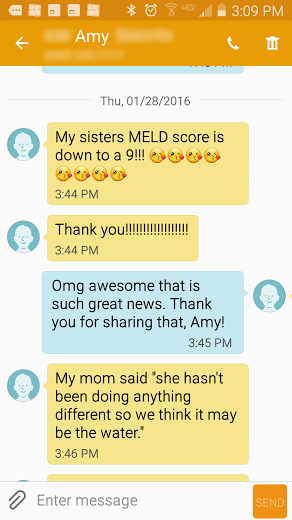 This testimonial is from my friend Amy, who got a machine to help her sister (who's MELD score was at 15 when she called me in early January of 2015. She got her score down to a 6, in 6 and a half weeks. People, this is unheard of. I don't think even the doctors had ever seen anything like it. 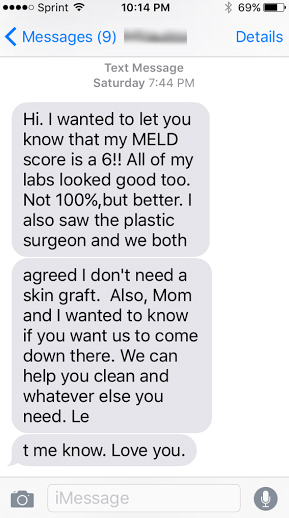 It took my husband a whole year to get his MELD score down to even an 8, and we were doing everything we could think of. 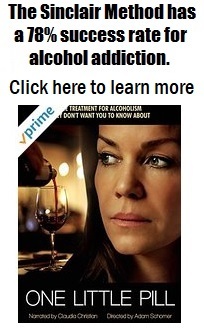 You can see more of Amy's sister's story by clicking HERE. 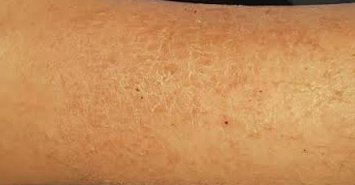 She was even able to heal a huge gaping wound on her leg, and her surgeon was dumbfounded. 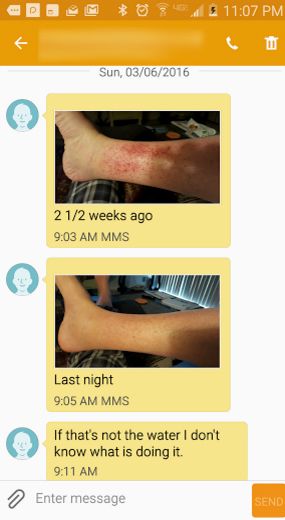 Amy also sent me a screen shot of the text messages her sister sent to her, just a few weeks later. Here are some photos sent by my friend Ricky. You can see his story by clicking HERE. This woman's MELD score was a "13" on April 29, 2016. 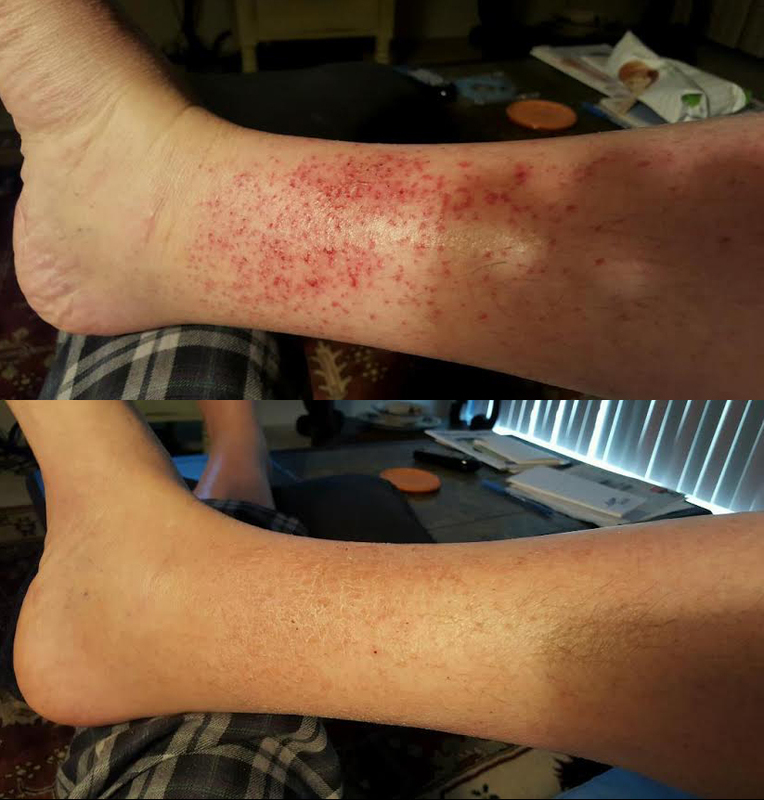 It went down to a 7 within 3 months! This one is from a woman named Hilary from the UK, who allowed me to use her testimonial but I am blocking out her last name : ). It was a little extra work to get her a machine because she's in the UK and needed extra paperwork. Usually a machine is very easy to order. But regardless, it's worth it to get a machine! 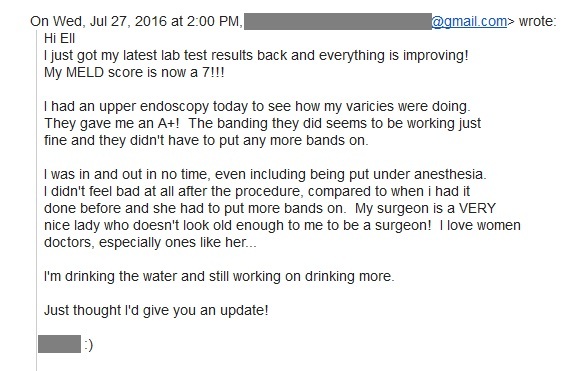 Here's another testimonial from a woman who saw great difference in her daughter's bloodwork after being on the water for a few weeks. And here is part of an email I got recently, from a woman whom I'll call Rebecca, who ordered a machine a few months ago, for her Mom. They thought the doctor was going to discuss transplant options, but then her mom was told her liver function tests were normal! 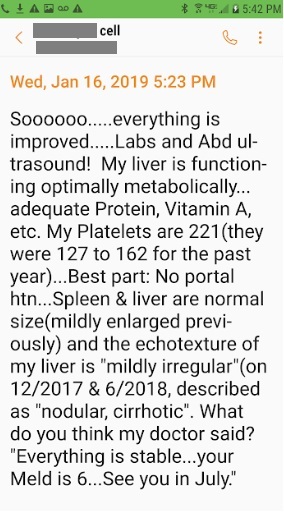 She still is slightly anemic but I have seen this in a lot of cirrhosis patients, and Rebecca told me it is slowly improving (her Mom is taking Hemaplex, which I wrote about on this page). In this particular case it seemed that she did still have some issues with varices but I am under the impression that this is slowly improving (her INR is currently in a normal range). I am hopeful I can learn more about what works for her, so I can share it with you guys in the future. I learn a lot from each person I speak with! I have even more stories (from other people, in video format) I can share with people who request more information about the water (they're located on my private blog). If you want to see them, just fill out the form on THIS PAGE. Please note that the company that makes this machine is NOT making any medical claims to treat, prevent, or cure ANY disease. These are just people who happened to drink the water and maybe out of some stroke of sheer luck, they just happened to feel great. I can't state anything as fact, all I can do is guarantee that if you don't really like it yourself, then you can get your money back. You can contact me for more details. Thanks again to everyone who was willing to share their stories with me... I really appreciate it!